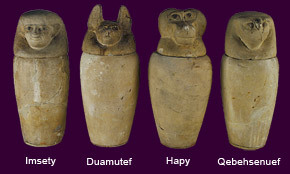 Canopic Jars were used by the ancient Egyptian during the rituals of mummification processes. These were used as containers in which to hold the internal organs of the deceased that was going to be mummified. The ancient Egyptians before mummifying their pharaohs and dead took out the internal soft organs. These organs contained a lot of fluid and could cause the body to putrefy and decompose quickly. The jars had lids or stoppers that were shaped as the head of one of the minor funerary deities known as the Four Sons of HORUS. It was the job of these four deities to protect the internal organs of the deceased; the Ancient Egyptians firmly believed that the deceased required his or her organs in order to be reborn in the Afterlife. For use in the afterlife they would be bandaged and vital organs placed individually in Canopic Jars. The jars were made of several materials such as limestone, calicite or alabaster. The finishing touch would be the stoppers being shaped like human heads, and later as Jackal, Baboon and Falcon heads. These jars were usually grouped in fours and placed alongside the Sarcophagi, and were supposedly guarded by the Sons of Horus. The baboon-headed Hapy guarded the lungs. The human-headed Imsety was the guardian of the liver. Jackal-headed Duamutef guarded the stomach and upper intestines and falcon-headed Qebehsenuef guarded the lower intestines. 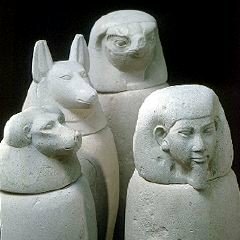 Canopic jars of the Old Kingdom (about 2686-2181 BC) are almost never inscribed, and have a plain lid. In the Middle Kingdom (about 2025-1700 BC), canopic jars are often inscribed, and the lids are often human headed. In the Nineteenth Dynasty and later each of the four lids takes the form of a different head - falcon, human, jackal and baboon (denoting the four children of Horus). 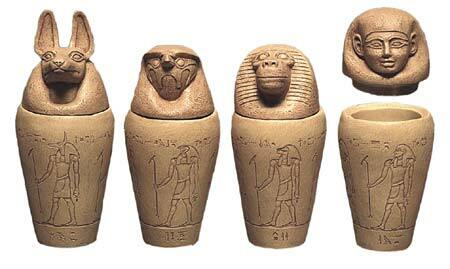 The four canopic jars that the internal organs were placed in are also buried with the deceased.